It has been a cold one here in the Portland Metro area! On Saturday there was a good coat of frost on everything by 10pm. Yesterday we had our first snowfall too, although nothing came close to sticking near my home. The higher elevations have had accumulation though. It is threatening to snow again today/tonight. It makes for an interesting Thanksgiving week, thats for sure! I can't wait to take some good frost pictures...it's 58 degrees outside right now so I may have to wait awhile. :) Your photo has such great detail. Sembra una pianta in vetro ! We got snow. And now it's going to get icy cold and freeze overnight. Great. Great macro! Love your blog. Nice frozen photo. 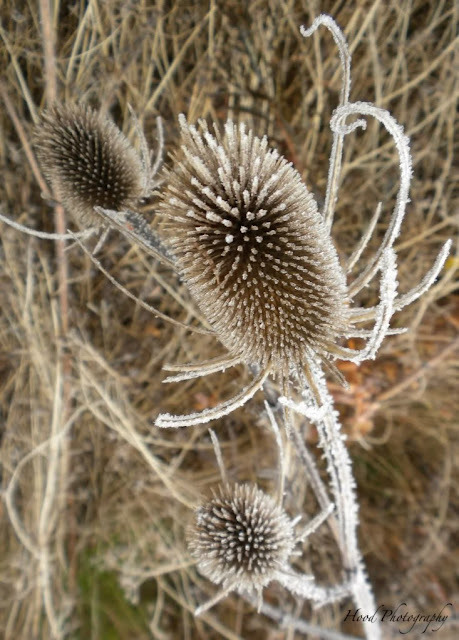 They look like teasel plant, did not realise you had them too.